The Place is a discipleship ministry that provides for emotional healing and spiritual growth through the power of Jesus Christ. We provide a safe place for biblical insight and encouragement, giving an opportunity for the Lord to help people deal with life controlling problems. We also provide opportunities for spiritual growth and development through seminars, conferences and retreats as well as Bible studies and individual mentoring. 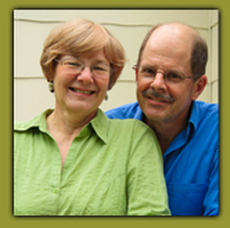 ﻿Ken & Barbara started their ministry at Living Waters, which is part of Reconciliation Ministries in Michigan. Ken Patriquin - Licensed Professional Counselor with 30 years of experience, first as a youth pastor, then counseling in various capacities including alcoholics at the Syracuse Rescue Mission, then 15 years with teenagers and later directing Foster Care and Adoption at Teen Ranch. Since then he has been counseling all ages and needs where he presently works at a private out-patient counseling center in Caro, Michigan. He has a heart for uninsured people who need Christian counseling and is counseling them through church referrals from surrounding communities. We believe in everything stated in the Nicean Creed. Our mission is to provide people with a place to come where God can heal them emotionally and spiritually, and where people are strengthened in their personal relationship with Christ.